Heather Leson is a technologist strengthening community collaboration via humanitarian technologies and social entrepreneurship. She builds partnerships, curates digital spaces, fosters volunteer engagement and delivers training while inspiring systems for co-creation with maps, code and data. At the International Federation of Red Cross Red Crescent, Heather coordinates global Data Literacy programs. She is past Board Member at the Humanitarian OpenStreetMap Team (2013 – 2017) and an Advisor for MapSwipe - using gamification systems to crowdsource disaster-based satellite imagery. Imagine this world if we all lent a digital hand. Heather is a frequent public speaker having presented at Crowdsourcing Week, European Space Agency Summer School, Impact Startup Europe, Understanding Risk, IEEE Humanitarian Technology Conference, Google Big Tent, OSCON, and TedxSilkRoad. Recently, she wrote articles on the power of data and digital literacy for the World Economic Forum and Civicus Datashift. 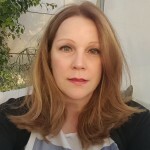 Heather holds a Bachelor of Arts degree in Combined Political Science and History from Carleton University, as well as a Library and Information Technician diploma from Seneca College of Applied Arts and Technology. Heather recently joined the International Federation of Red Cross Red Crescent to build global Data Literacy programs. At Qatar Computing Research Institute, Qatar Foundation, she created projects and programmes for social innovation and humanitarian software. Specializing in strategic planning, community engagement, and fundraising, Heather is the Past-President, Current Board Member Humanitarian OpenStreetMap Team. She demonstrates mentorship and leadership as an Infogr.am ambassador and adviser for numerous social technology start-ups including Mapswipe, School of Data, Jump2Spot and Invstg8net. She is a member of the Standby Task Force and Non-Commercial User Constituency, ICANN. Organizations she leads in include the Crisis Mappers Network, Humanitarian OpenStreetMap Team, Open Knowledge Foundation (School of Data), Ushahidi, Random Hacks of Kindness, Mozilla and more. Recognized as a digital humanitarian leader, Crowdsourcing Week cited her as one of the Top 10 Canadian Experts. Heather curates numerous civil society, open source and technology workshops and is a frequent public speaker including such events as IEEE Humanitarian Technology Conference, Google Big Tent, UN Human Rights Council, World Bank, OSCON, TedxSilkRoad, UNSpider and various Canadian government events. Heather has over 15 years of experience in technical incident management, software life-cycle development, customer care, and Internet communications. She holds a Bachelor of Arts degree in Combined Political Science and History from Carleton University in Canada’s capital city of Ottawa, and a Library and Information Technician diploma from Seneca College of Applied Arts and Technology in Toronto. Leadership programmes that Heather has participated include Personal Democracy Forum Google Fellow) and a certificate for the Annenberg-Oxford Media Policy Summer Institute (2012). Getting people involved in their world with technology is my life’s goal. This journey from volunteering to leading digital humanitarian organizations has changed my life. Imagine the world if we all lent a digital hand. Just stumbled upon your site while doing research for a project on crisis mapping. This question is more to your comment on volunteering. How can one get involved in volunteering via the internet? I am looking for opportunities to help and grow my understanding of the open source/open web community. Any suggestions?